The MSA ALTAIR 5X Multi-Gas Monitor excels within tough industrial environments without the worry of breaking the valuable gas detector. The Altair 5X Detector passes 10-ft. drop test and has third-party IP65 certification for dust and water ingress. All new MSA Altair 5X gas monitors are now equipped with Bluetooth wireless which allows to monitor gas readings and alarms remotely as well as to configure the instruments. 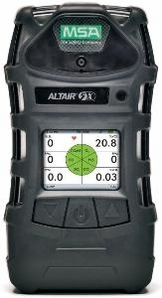 MSA 10116928 Altair 5X Multi-Gas Detector features a Color Display, Lith-Ion Battery, 120V AC Charger, LEL, O2, CO, H2S Sensors, 10ft-sampling line, 1-ft probe.